Decadent brownies flecked with chocolate and toffee chips and baked in mini cast iron skillets.You guys know that I have a pretty serious love affair going on with desserts, like my No Bake Cookies. However, when it comes to individually portioned desserts, my obsession becomes even greater. From Nutella Cheesecake Brownie Trifles to No Bake Raspberry Cheesecakes – I’m simply all about them. Not only do I have a love affair with individual desserts, I’m also pretty obsessed with Amazon. With a new baby in the house, convenience is super important, so I find myself using my Prime account to buy everything from baby clothes to dog bones. There’s really nothing better than having necessities (hello, salted caramel brownie brittle) delivered directly to your door. Let’s just say we’re on a first name basis with our amazing UPS delivery man. Although I’m fairly certain he secretly thinks we’re hoarders. Last week, Lodge Miniature Cast Iron Pans popped up under the Amazon Recommends section and they promptly went into my cart. I adore cast iron pans, but mini cast iron pans takes that adoration to a completely different level. I immediately started dreaming of mini frittatas, mini blueberry buckles, and cast iron skillet brownies. And it definitely didn’t take long for the mini skillet brownies to become a delicious reality. I started with a decadent fudgy brownie base and folded in chocolate chips and toffee bits – because let’s be honest here, less is definitely not more when it comes to brownies. Lodge 5-inch Cast Iron Skillets from Amazon. In a large bowl over simmering water, melt butter, 4 ounces of chocolate chips, and unsweetened chocolate until smooth. Set aside and let cool for about 15 minutes. In a large bowl, stir together the eggs, vanilla and sugar. Stir the chocolate mixture into the egg mixture until well combined. In a medium bowl, sift together 1/4 cup of flour, baking powder, and salt and add to the chocolate mixture, stirring until just combined. In a medium bowl, toss together the remaining 1/2 cup of chocolate chips, toffee bits and one tablespoon of flour and fold them into the chocolate mixture. Divide batter into five 3-1/2 inch cast iron skillets and place them on a baking sheet. Bake for 25-30 minutes, taking care not to overbake. 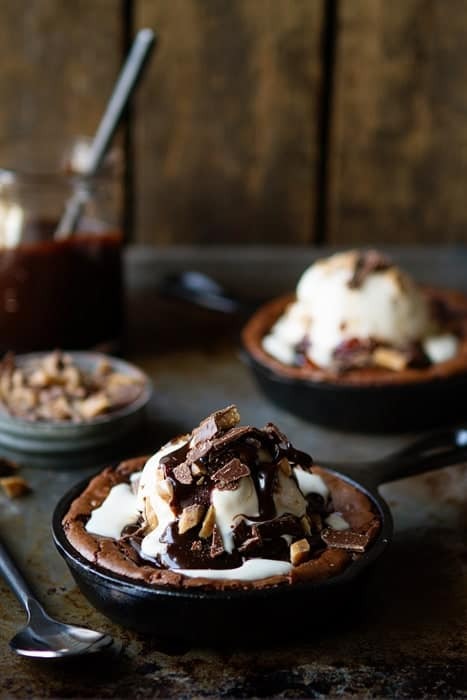 If desired, top warm skillet brownies with vanilla ice cream, hot fudge sauce, and toffee bits. Recipe slightly adapted from Ina Garten via Food Network. *Amazon links are from My Baking Addiction’s Affiliate account. These are genius! And I really need some of those mini skillets – how wonderful! Oh these look fabulous, out of curiosity what size mini skillets do you have here? are they the 3.5 inch of the 5 inch??? I used the 5-inch skillets. You can find them on Amazon. I hope the link helps! Thanks for stopping by. I don’t have that many small skillet but would the cooking time change a lot if I put it in one large one? These look great! These look so good! Where can I find these mini skillets? You can find them on Amazon. I hope the link helps! Thanks for stopping by. 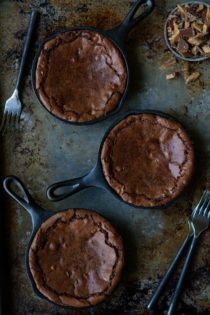 Skillet brownies?! HECK YES! This recipe is awesome! These look so good! I think I’ll be able to make a vegan version with my brownie recipe from Veganosity: http://www.veganosity.com/food/vegan-chocolate-chunk-brownies/ Check it out if you want to. They’re super good! Why is it that everything looks so much better in mini form? lol! Cute skillets, and it looks like SUCH an amazing recipe! I can’t stop looking at these photos! And thinking about how I very much need to get my hands on a skillet! Amazing! Ooh, I got mini skillet pans a few months ago and have only used them once (for cobbler) since then. Looks like I need to bust them out for these brownies! These look amazing! I love little cast iron skillets! Love the mini skillets, how cute are they. The brownies look fabulous even on their own! Ok anything brownie is amazing in my book, but girl you took it to a whole new level!! Yum is all I can say and wrapped up in a cute, nice size single serving, almost makes me think there’s less calories! ;). Thanks for this! Do you think this would work in mini-casuelas? They are 5″ like skillets but are the material of cookie sheets. And rather than one long handle they are two handles on the pan. Would I only need to adjust the cook time? What would you recommend? I think that would work just fine, and I think that the baking time would be the same. Greased or increased skillet? Definitely getting baby skillet!!!!! These look and sound fantastic!! Makes my mouth water just thinking about them. Thanks so much! Have a wonderful day and thank you for following MBA! I love the idea of making things in skillets – you think I could make this in an 8 inch one? A very large brownie. I think that would probably work. Can’t find these cute skillets? Go to lodgemfg.com for all kinds and sizes. They have lids too, if you need one. Love this recipe. Thanks for posting. They have these skillets at lodgemfg.com too for $6.25 each. You can also get these mini skillets from lodgemfg.com for $6.25. Thanks for the recipe. I’m going to make these a lot for my chocoholic husband. Could these also be baked in ramekins? These are so cute – good thing they are individual portions, I don’t think I’d share. How long would the baking time be if I use a 6 inch skillet? I think the cooking time is going to be close to the same. Oven cooking times can vary, so I would keep an eye on them at about 20 minutes. Do you think the recipe would work in one large skillet? I do think you could bake it in one large skillet. You may need to adjust the baking time. I hope this is helpful. wow. thanks. i am going to try in my large cast iron. the mini’s are a bit on the expensive side to make . Hi! The directions say to divide among five 3.5 inch skillets, so if using 5 inch skillets how many do you use? I’m guessing it may fit into 3? Thanks! I would say that 3 would be about right. Thanks for stopping by. These look amazing! I recently got a cast iron pan and I’m obsessed with it. I can’t wait to try these! Wow! It looks very very tasty! Where did you get this flatware? Brownies look awesome! I need to try these this Fall! Hello. The flatware is from Crate and Barrel. Thanks for stopping by! Can this be made in one bigger cast iron skillet? Look yummy but don’t know where to find them that small. Hi, Jeanne! I think they could be made in a bigger skillet. Just watch the baking time so they don’t over bake. I hope you enjoy it! I’m wondering how to make these in a 3.5 inch cast iron skillet (2 servings). Would really appreciate any info on the quantity/ratio of ingredients or even some tips on how to find these! This recipe yields 5 servings when baked in a 3.5-inch skillet. I would cut the recipe in half to yield about 2.5 servings. Reducing the ratios to anything less may be a little difficult. I hope this helps! I dont have a skillet that goes into the ove :-( can i make them in a normal muffin tin? Hi, Tari! I think you could probably make them in a muffin tin. Make sure you watch them as they bake so they don’t get too done. I think the baking time would probably reduce by almost as much as half. I hope you enjoy them! These look so cute and very delicious. Can coca powder be substituted for the chocolate squares? If so, how much for the same serving? I looked through the comments (before posting) and didn’t see any similar questions. Thanks so much! Thanks so much for stopping by. I haven’t tried this recipe using cocoa powder, so I am not sure how it will work in this recipe. Sorry I am not more of a help. In answer to the above question about substituting cocoa for unsweetened chocolate. The chocolate square is 1 ounce and that would be equal to 3 tablespoons of cocoa plus 1 tablespoon of butter. I can’t wait to try this recipe. It sounds so delicious and we are chocolate lovers at our house. Thank you, Donna! We’re chocolate lovers at our house, too!